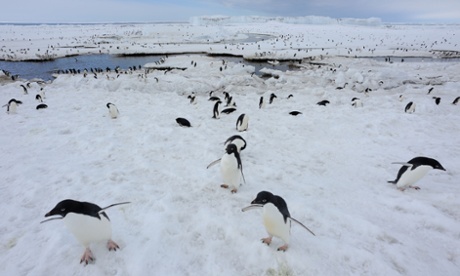 The Guardian reports, 30th January 2014: “Penguins are in peril because of extreme environmental conditions linked to climate change, research has shown. Two new studies highlight the plight of penguin colonies trying to cope with the effects of global warming in Argentina and Antarctica. At both locations, the beguiling birds face an uncertain future. 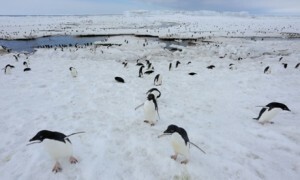 Adelie penguins on Ross Island, Antarctica, are finding it harder to feed as melting sea ice fragments to form giant icebergs. Climate change is killing chicks from the world’s biggest colony of Magellanic penguins at Punta Tombo, Argentina, by increasing the rate of drenching rainstorms and heatwaves, say scientists.